As I gather my thoughts and reflect on this year’s One Theatre World (OTW) event, I can feel my eyes refill with happy tears. Joyful, teary-eyed reunions, new connections, delightful performances and engaging, inspiring sessions filled my week. For fifteen hours a day for three days, I was surrounded by creative, passionate artists who both support and inspire my own creative development. 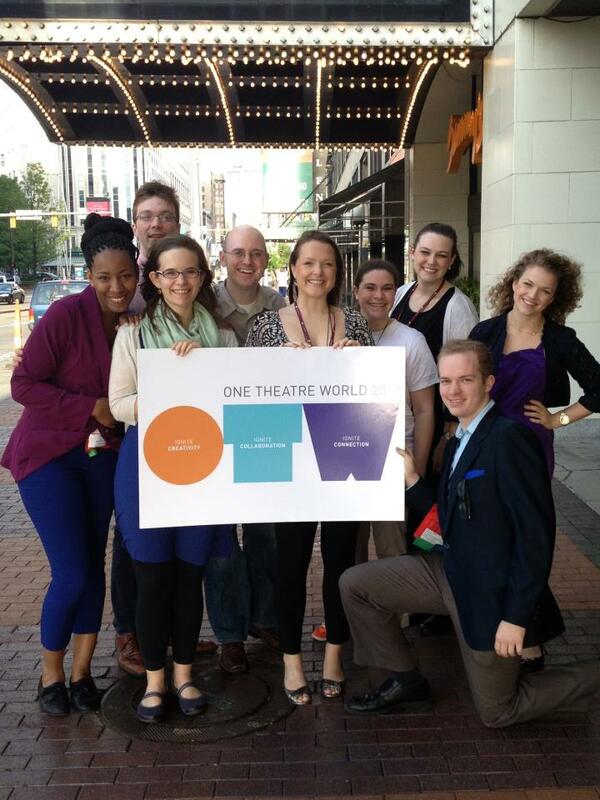 In line with this year’s conference theme, “Ignite creativity, collaboration and connection,” I decided to break down my highlights of this year’s One Theatre World in terms of this alliterative theme that perfectly encompasses both my OTW 2013 experience and TYA/USA as an organization. I attended a session led by members of Trusty Sidekick theatre company, based in New York City who presented on their development process for Shadow Play, a theatre piece for audiences aged 2-5. Trusty Sidekick developed Shadow Play in collaboration with pre-K students through creative drama and process-drama inspired activities. This particularly excites me as a model for community engagement in new work development. During the session I was silently freaking out (in a good way) about how this project combines my love for working with this age group as a teaching artist and my recent experience as an actor/facilitator in theatre for the very young. Trusty Sidekick’s session truly ignited my creativity with a volume of new ideas cascading through my brain as I look forward to determining a thesis project. In his closing keynote address, Finnegan Kruckemeyer hit home on a number of salient points. This incredible playwright and storyteller identified the essence of this conference with the simple sentence, “It’s nicer to work with nice people.” TYA contains a wealth of nice people. Nice people who are as creative, supportive and hard-working as they are kind. No matter what field you find yourself in, when you surround yourself with colleagues who are motivated by similar values, you do better work. The attention to learning and education that permeates our theatre-making in TYA came up in many of the discussions I had at OTW. Whether or not it is overtly named as a goal of an artistic process, this awareness of the educational value of the arts also drives us, the professional artists, to continue learning and refining our craft. We consciously seek out new ways to grow, and we support artistic growth in one another. The supportive bonds I found at OTW this year moved me to tears multiple times. Whether I was reuniting with former co-workers or simply taking in the energy and excitement that filled each space at PlayhouseSquare, significant connections were formed, deepened and sustained. At OTW 2011, I was floored when accomplished playwright, Laurie Brooks approached me and introduced herself when she could see that I was a new member of this community. This year, knowing more people in attendance created a different experience for me, but the connections were just as meaningful. OTW is not a race to collect the most business cards (or how many Minglebird connections you make- though that was a fun way to break the ice!). The artists who comprise the OTW community value making and sustaining connections because you never know where you’ll encounter future collaborators. We are invested in serving each other as resources as we continue to serve young audiences and families through the high quality arts experiences we create together. I’m going to add a new big word to the alliteration that I am taking away from this experience: confidence. At my first OTW in 2011, I soaked it all in like a human sponge. Attending this year’s conference as a graduate student and OTW apprentice gave me the confidence boost to introduce myself to artists and TYA leaders whose work I admire and engage in conversation about their work, my work and the field at large. A huge thank you to the TYA/USA board and the OTW 2013 planning committee for facilitating a high-quality conference experience full of creativity, collaboration and connection.